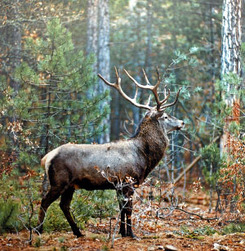 Bulgaria is a top destination for hunting red deer. Bulgaria has proved to be one of the most popular international destinations for red deer hunting among "hunting tourists," according to the State Forestry Agency. A total of 73 foreign hunters arrived to hunt red deer only for the past month, the Agency said in a statement, adding that the red deer population in Bulgaria numbers between 18 000 and 21 000 animals. The trophies from red deer's horns that are obtained by the hunters in Bulgaria usually weigh between 7 kg and 14 kg. The fall period (September-October) is the best time to hunt red deer, the Forestry Agency says. The hunting tourists who came for red deer trophies in Bulgaria in September were from Germany, Austria, France, Spain, and Denmark. "The competitive and attractive prices for organized hunting tourism are an opportunity not only to provoke interest for Bulgaria with foreign hunters but also to promote Bulgaria's eco and rural tourism," the Agency statement reads. In March 2011, the Forestry Agency announced data for 2010 showing that Bulgaria's hunting tourism is enjoying growing local and international interest: a total of 3 992 foreign nationals and 3 761 Bulgarians had hunting tourism trips in Bulgaria in 2010. The group hunt of wild pigs is the most sought after hunting tourism attraction in Bulgaria, the data indicates. The foreign nationals who hunt in Bulgaria come primarily from Germany, France, Italy, Spain, and Greece. In 2010, Bulgaria's state hunting areas, subdivisions of the Forestry Agency, registered a total of revenue of EUR 2.050 M from hunting tourism. The state hunting areas "Cherekitsa", "Rositsa", and "Cherni Lom" have generated the largest revenues.